Visit us in the Terhune Orchards Vineyard and Winery tasting room as we continue to celebrate Valentine's Day. 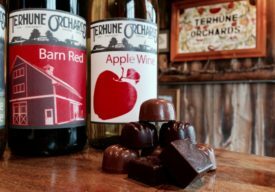 Enjoy chocolate baked goods homemade in Terhune’s own bakery paired with our award-winning wines. Bring your loved ones, friends and family to enjoy sweet treats.